Take a pickled egg and roll it in celery salt, then seasoned flour. Divide the sausagemeat into six portions. Roll each portion into a patty big enough to wrap around an egg. 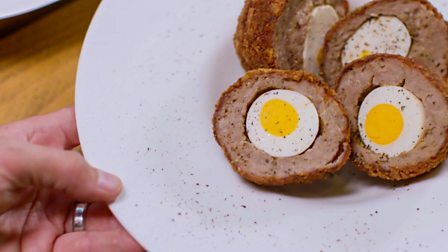 Wrap the sausagemeat around the eggs and roll into a ball shape. Mix the breadcrumbs with the crisps. Dust the sausage-coated egg in flour, dip in beaten egg and then roll in the breadcrumb mixture. Heat the oil in a deep-fat fryer or a deep-sided, heavy-bottomed pan to 160C, or until a breadcrumb sizzles and turns golden-brown when dropped into it. (CAUTION: hot oil can be dangerous. Do not over-fill the pan or leave unattended). Fry the eggs for about 8-10 minutes until golden-brown. Alternatively, shallow fry, turning occasionally, until cooked through.